Father Pierre De Smet, the Jesuit missionary andexplorer of the American West, described the Coeur d’Alene Indians upon his first encounter with them in 1842 as extremely receptive to his Christian message. De Smet baptized twenty-four adults and many small children among the Coeur D’Alene people during that first visit. De Smet left after a few days, but sent his Jesuit colleagues later that same year to stay with the Indians over the winter and to establish a Catholic mission among them. 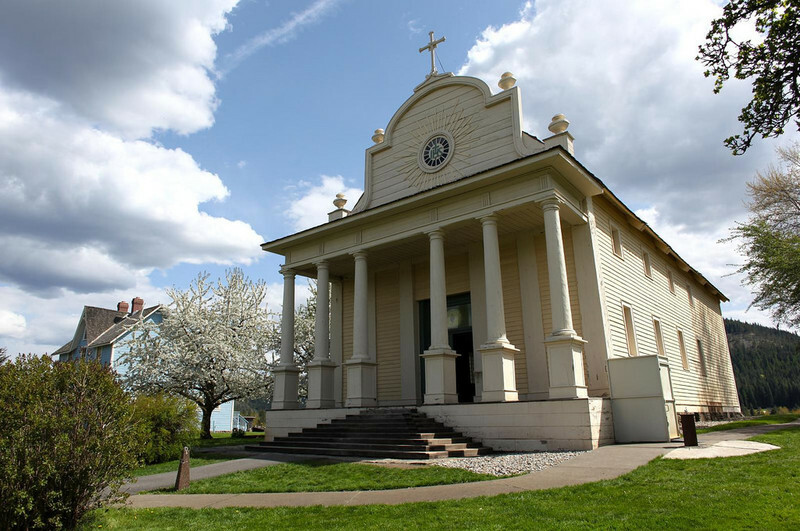 Father Anthony Ravalli, a Jesuit missionary and architect from Italy, designed and led the construction of the Church of the Sacred Heart from 1850–53, and the Coeur D’Alene people provided much of the labor necessary to complete the project. Father De Smet’s later writings contain numerous references to the Sacred Heart mission, and he often stayed there during his travels between missions. On one occasion in 1863, Father De Smet stayed at the mission for six days and wrote about the changes occurring with the growing presence of white miners and settlers. He referenced a report by a U.S. Army captain that claimed that the only “salvation” for Indians would be “to be removed far, far from [the] presence [of the whites]” and that Indians “can never exist in contact with whites.” Father De Smet himself condemned this suggestion of removal and wrote, “May heaven preserve [the Coeur d’Alene Indians] from contact with the whites!” His advocacy for Indians, however, was predicated mainly on their conversion and faithfulness to Christianity. The legacy of Pierre De Smet and his Jesuit missions, including Sacred Heart, is a subject of debate in the current postcolonial era. Traditionalist historians and biographers generally portray Father De Smet as a heroic explorer and a savior to the native peoples of western North America, specifically one who sought to understand and honor native culture. However, as theologian George E. Tinker writes, “Any Euroamerican’s understanding of or appreciation for Indian cultures was subject to severe cultural limitations.” Pierre De Smet may have tried to understand Indian culture, but ultimately the Jesuit approach was to quickly “impose European cultural values.” De Smet himself actively sought to use his missions to reorganize Indian civilization into a sedentary society that could better receive Christianity. So while De Smet himself was not directly involved in the removal and extermination of Indians (in fact he spoke against it), the cultural colonization of which he was a part was aimed at eroding Indian identity and culture. The Mission of the Sacred Heart, like other colonialist European or American religious ventures, should be viewed as a tool of western imperialism. Sacred Heart Mission: Exterior of the mission church. The mission church is the oldest building in Idaho. Built from 1850-1853, it is now officially owned by the Coeur D’Alene tribe, though it is managed by Idaho Parks and Recreation. ~ Creator: Hayes, Holly, from Flickr. "Sacred Heart Mission," available at https://www.flickr.com/photos/sacred_destinations/4204107240/in/photolist-iTiMKB-ffLtHh-8F1rdR-6tvAUA-6tvAVN-6trsXx-6trsSH-7prgrF-6tvxFJ-6trpHn-6trpHH-6tvASo-6trpJ6-6tvAVf-U8xYB1-6Gao6i-6GetfS-6tvATy-7pv9BA-7pv9Cj-6trsVx-6trsUr-6tvARG-6Ger5S-6tvxC9-VADYoe-ffwdbi-6LoFtN-6tvxHj-5DgZzE-s2qh5M-s2qmAR-sFD8KS-s2qjNT-sFLVCv-sVUM9U-s2eepj-sYeGZR-sYeDCF-s2qjdK-sVUNBU-sFEuuh-sFLZav-sYeDRX. Sacred Heart Mission: Interior of the mission church. 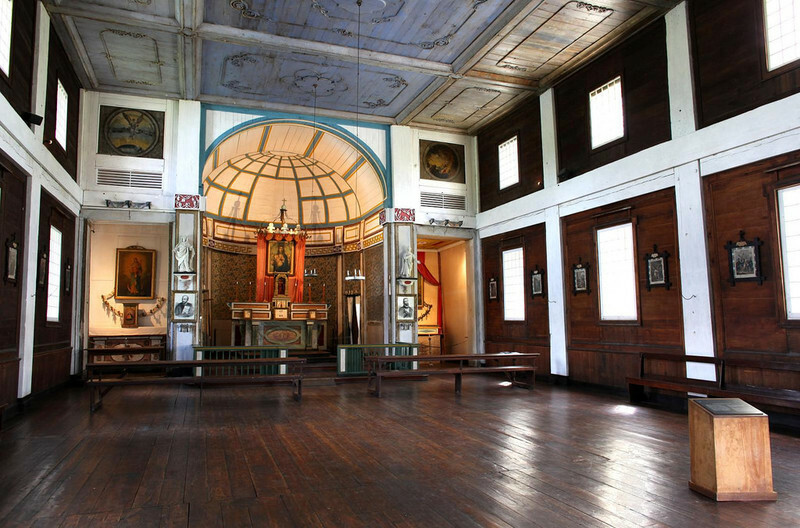 The interior of the mission church shows the beautiful craftsmanship of the original Jesuit missionaries and Native Americans who built it. Catholic iconography can be seen on the walls. ~ Creator: Hayes, Holly, from Flickr. "Sacred Heart Mission," available at https://www.flickr.com/photos/sacred_destinations/4203349765/in/photolist-iTiMKB-ffLtHh-8F1rdR-6tvAUA-6tvAVN-6trsXx-6trsSH-7prgrF-6tvxFJ-6tvATy-6trpHn-7pv9Cj-6trpHH-6trsVx-6trsUr-6tvARG-6tvASo-6trpJ6-6tvAVf-6Ger5S-6tvxC9-U8xYB1-6Gao6i-7pv9BA-6GetfS-VADYoe-s2qh5M-s2qmAR-sFD8KS-s2qjNT-sFLVCv-sVUM9U-s2eepj-sYeGZR-sYeDCF-s2qjdK-sVUNBU-sFEuuh-sFLZav-sYeDRX-ffwdbi-6LoFtN-6tvxHj-5DgZzE. Sacred Heart Mission: Parlor in the parish house. Next to the mission church is the parish house, which was rebuilt in 1887 following a fire. The parlor is decorated to show what it may have looked like when first built. ~ Source: Hayes, Holly, from Flickr. "Sacred Heart Mission," available at https://www.flickr.com/photos/sacred_destinations/3593093860/in/photolist-iTiMKB-8F1rdR-6trsXx-6trsSH-6tvxFJ-6trpHn-7pv9Cj-6trpHH-6tvARG-6trpJ6-6tvAVf-6Ger5S-U8xYB1-6Gao6i-6GetfS-ffLtHh-6tvAUA-6tvAVN-7prgrF-6tvATy-7pv9BA-6trsVx-6trsUr-6tvASo-6tvxC9-VADYoe-s2qh5M-s2qmAR-sFD8KS-s2qjNT-sFLVCv-sVUM9U-s2eepj-sYeGZR-sYeDCF-s2qjdK-sVUNBU-sFEuuh-sFLZav-sYeDRX-ffwdbi-6tvxHj-5DgZzE-6LoFtN/. 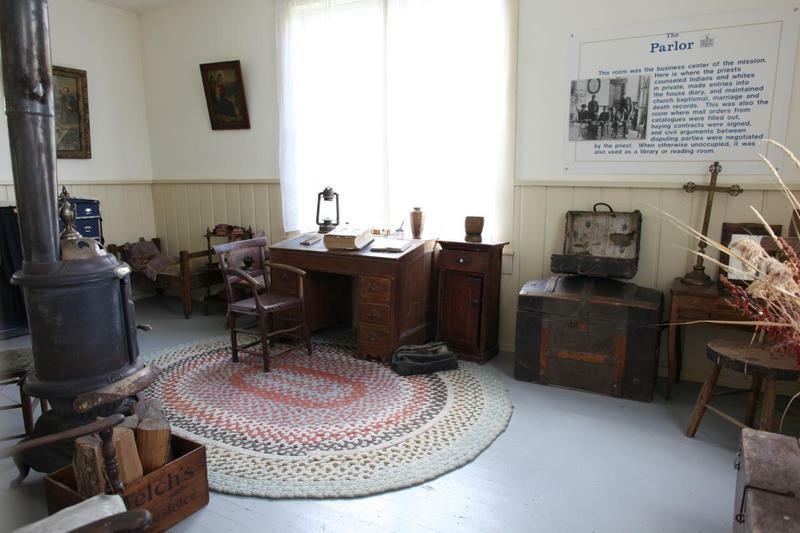 Sam Utley, Brigham Young University, “The Sacred Heart Mission and “Benign” Cultural Colonization,” Intermountain Histories, accessed April 19, 2019, https://www.intermountainhistories.org/items/show/190. De Smet, Pierre-Jean. Life, Letters, and Travels of Father De Smet among the North American Indians. New York, NY: Kraus Reprint, 1969. From Idaho Parks and Recreation. “Coeur d' Alene's Old Mission State Park,” available at parksandrecreation.idaho.gov/parks/coeur-d-alenes-old-mission. Schroer, Blanche Higgins, et al. “Cataldo Mission.” National Register of Historic Places Inventory/Nomination Form. Historic Sites Survey, National Park Service, Washington D.C., 19 May 1976. Terrell, John Upton. Black Robe. New York, NY: Doubleday & Company, Inc.: 1964. Tinker, George E. Missionary Conquest: The Gospel and Native American Cultural Genocide. Minneapolis, MN: Fortress Press, 1993.